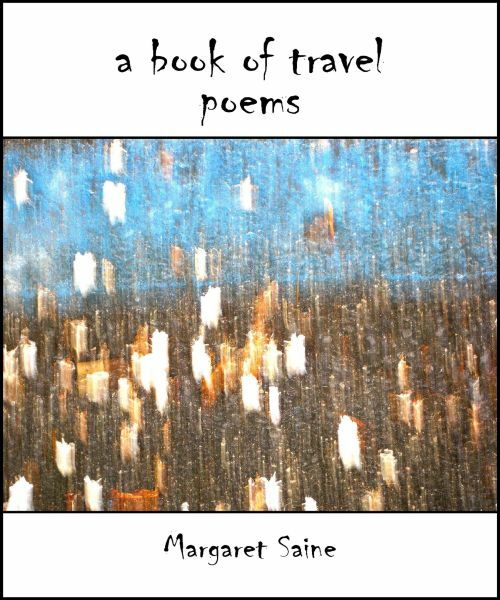 A Book of Travel is poetry in the cast of the moon inside the broken dance of love that flowers into the New Age Renaissance Republique of Poetry by Margaret Saine and Subterranean Blue Poetry. Margaret Saine (Poet, poetry editor, teacher) lives and works in California. She travels extensively, and is very well read speaking and writing in 5 languages including German, French, Italian. She is the Poetry Editor at California Quarterly and is an administrator at New Voices, Gina Nemo's Facebook site for publishing poetry. The title of the book "A Book of Travel" was inspired by Evliya Celebi a 17th Century Turkish philosopher's work of the same name. In this work he writes on his travels through Europe and makes observations of the different languages, it is an ideation on the Ottoman Empire by a Muslim. She also writes that the poetry is inspired by landscape. Saine's work is infused with quotes from famous writers and contains translations in French, Italian, German and Macedonian. A Book of Travel is a book of wanderlust and perhaps lost love searching for love, in the voice of the wise child. The poetry is experiential and brushes with Imagism and Romanticism, the classicism of nature imagery, flowering into the New Age. The poetry tells stories of travel, Rome, the ancients (Ophelia, Eurydice, Orpheus, St. Augustine, Bacchus, Ariadne) art and artists, gardens, childhood, women, love, sparrows and more. This poetry is enigmatic, sometimes a subtle humour, a subtle dislocation within the broken architecture of the old cityscape economy. As if traveling by train, watching out the windows, someone who lives in foreign lands, a place of mystery, a place of the past, the haunts of an old love. A Poet for Peace, there is an activist theme to the writing, "The Story of Jorge Peña Hen" is about the famous musician who was executed by the Pinochet dictatorship. Through the broken dance, the light shines in, it is as if she is writing Emily Dickinson out of the box. A great read for the long winter nights, A Book of Travel by Margaret Saine. 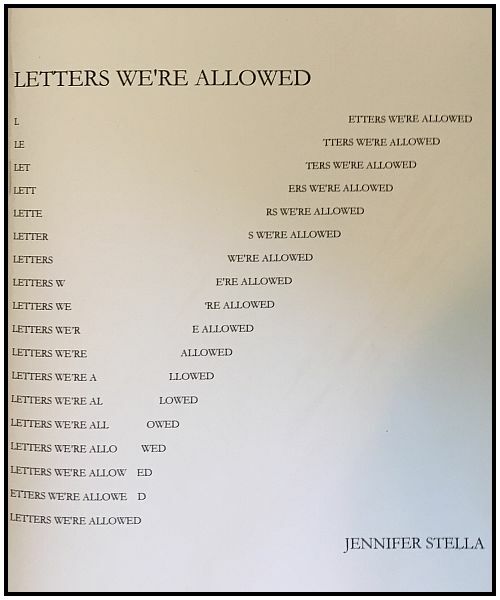 Letters We're Allowed is a brilliant dark surrealist haunting in a series of "love" letters from the New Age Renaissance Republic of Poetry by Jennifer Stella and above/ground press. Jennifer Stella is a Poet, writer and doctor who lives in San Francisco and works with the Peace Corps and Doctors without Borders. She has served in Cameroon and the Democratic Republic of Congo. She also holds an MFA in poetry from studying at Brooklyn College. Her prose and poetry is published internationally and she has been featured in the poetry journals Pharos, Eleven Eleven, the Dusie Blog, Calyx, Tupelo Quarterly and Der Grief amongst others. Letters We're Allowed is a series of short "love" letters in poetic narrative between Sivan and Jenny. The asides in sign on and sign off cues are creative and enigmatic and sometimes strike as funny in an absurdist presentation. They talk around each other at tangents in symbols and dark fantasia, it is a story of constraints of time and distance and emotion, as if they are warriors of love, perhaps too hurt and tired to connect on any serious note, perhaps a reflection of the overconstructed violence in love/war N.A. That the series of "love" letters continues on any level is mysterious and a tribute to the longing for the universal essential love. Letters We're Allowed is a creative masterpiece, a fantastical artefact of culture, a photograph of the emerging New Society in the New Age. A brilliant write by Jennifer Stella. "there were the houses surrounding Les Halles, "the whole neighbourhood as bottomless as a vast perforated basket, each house concealing in its flanks a mysterious labyrinth leading who knows where, toward underground passages, sewers, catacombs, no storefront an ordinary cul-de-sac but everyone an antechamber . . ."
- for clochards looking for a place to sleep in winter. the trees in rain . . ."
O' Paris, tender is my heart, the night. 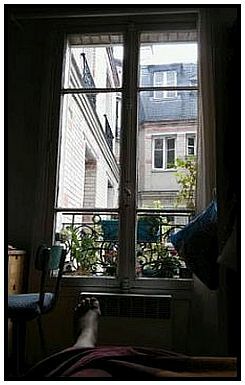 "He bore to the right to get to rue Lamarck and suddenly, under the vast sky, heavy with rain, the whole of Paris appeared. He took in its receding immensity. Smoke coming from different paints wove together and fluttered in sharp chorus. The wind blew through the acacias, their jumble of foliage blending with the fog. In the distance thousands of fires flickered." into night . . ."
blind her . . .
"What was it, then? It was an inhabited location where there was no body, it was a deserted place where there was somebody; it was a boulevard in the big city, a street in Paris, that was wilder at night than a forest, gloomier in daylight than a graveyard." "a clochard. This word, the first published use of which was apparently by Aristide Bruant in 1895, derives from cloche (bell) and signifies a bum or hobo. There were various theories as to its etymology . . . My favourite, though is Jean-Paul Clébert's (writer): that the cloche is the sky, and all who sleep under it are its children." inside night . . ."
Rebecca Anne Banks lives in the New Age Renaissance Republique of Poetry. She has been writing and producing artistic content for 37 years and is the author of over 30 books of poetry, a guide to the Holy Spirit, a primer on marriage discernment, a family cookbook, a book of children's stories, a book of World Peace Newsletters, all available at Amazon Stations. She has produced 3 CD`s of Folk/Rock music and has 17 CD's of music awaiting production. She won an IAIRA Award for Top 55 Internet Airplays for Angel Song (2010). She is an Associate Member of the League of Canadian Poets. She is also the CEO/Artist at Tea at Tympani Lane Records (www.tympanilanerecords.com), the Book Reviewer at The Book Reviewer ( www.thebookreviewer.ca)and the Quilt Artist at Kintsugi Art Quilts (www.kintsugiartquilts.com). James Fenton (Poet, journalist, professor) is born in England. He studied at Oxford University and won the Newdigate Prize for Poetry. He worked as a journalist in East Asia war zones reporting for the New Statesman journal and The Guardian. He was a theater and book critic for The Sunday Times. He is well decorated for his poetic accomplishments, a fellow off the Royal Society of Literature (1983), Oxford Professor of Poetry (1994 - 1999), Queen's Gold Medal winner for Poetry (2007), PEN Pinter Prize (2015). He is best known for his books of poetry Out of Danger (1994), Selected Poems (2006), Yellow Tulips: Poems 1968 - 2011 (2012) and the gardening book A Garden from a Hundred Packets of Seeds (2001) and the oratorio The Love Bomb (2003). Mike McNamara. Born in Northern Ireland but living in S. Wales, Mike McNamara (B.A. Hons.) has his Selected Poems 'Overhearing The Incoherent' published by Grevatt and Grevatt in 1997. Mike is lead singer with Big Mac's Wholly Soul Band and a published songwriter. His poetry has been published in Envoi, Orbis, Tears in the Fence, New Welsh Review, Acumen, The Dawntreader etc. Mike also had a selection of poems published in The Pterodactyl's Wing (Parthian, 2003). Margaret Saine was born in Germany and lives in California. She has taught French and Hispanic literatures and writes in five languages, also translating other poets between them. Her books of poetry are Bodyscapes, Words of Art, Lit Angels, and Gardens of the Earth. Saine has also published four poetry books and a childhood memoir in Germany. She has written over 4,000 haiku and has several manuscripts in Italian, French and Spanish ready for publication. Jackie Sizemore. With no hometown to speak of, Jackie Sizemore comes from the Rustbelt, the South, and Tokyo. Her writing has appeared in Crab Orchard Review, Eastern Iowa Review, Citron Review, Opossum, Mojo/Mikrokosmos, and Noble/Gas Qtrly. Jackie was a finalist for the Barbara Deming Memorial Fund, longlisted for the Alpine Fellowship in Italy, and her lyric essay was listed as a Notable Essay in The Best American Essays (2018). She studied photography at Carnegie Mellon University. Follow her @sizemorepov. Jennifer Stella (Poet, writer and doctor) lives and works in San Francisco. She works with the Peace Corps and Doctors without Borders and has served in Cameroon and the Democratic Republic of Congo. She has studied at Brooklyn College and earned an MFA in poetry. She is published internationally, her first Chapbook Your Lapidarium Feels Wrought was published by Ugly Duckling Presse (2016).